Fremont Canyon and the Cardwell (meadow) stretch of the North Platte River represent the section between Pathfinder Reservoir and Alcova Reservoir. In the past 10 years, minimum flows (72 cfs), have been established courtesy of the Wyoming Game and Fish Department and Wyoming Fly Casters. Due to the minimum flow implementation, abundant bug life and the intimate nature of this tailwater, it has become increasingly popular. This particular fishery has both rainbow and brown trout with most recent population estimates of 150 fish per mile, with 3:1 rainbows to browns. Cardwell is a technical place to fish simply because the fish are not easy to catch. However, you can fish this water without getting your feet wet and there are very few obstacles to interfere with casting. Rainbow trout make up a majority of the population for Fremont Canyon fishing, but all species—including browns and cutthroat trout—grow to incredible size in both the canyon and meadow sections. Midges, baetis, caddis and tricos are the primary hatches at Cardwell and Fremont Canyon. PMDs and sallies also occur here but not with the frequency of the other hatches. Aside from these hatches, scuds, leeches, crayfish, annelids and small forage fish round out the diet for Cardwell and Fremont Canyon trout. Similar to both Grey Reef and the Miracle Mile, Cardwell and Fremont offer fantastic year-round fishing. That said, nymphing is the most productive technique on a daily basis. While you can nymph all year long, the dry-fly and streamer fishing can be incredible. Dry-fly action is best when there are baetis, caddis, tricos or midges present. Concentrate on the flats in the Cardwell section when the fish are looking up. When they’re not, the pocketwater, deep pools, and tailouts hide some aggressive trout waiting to smash your streamer—especially on cloudy days. As the river leaves Pathfinder Dam it makes its way through a small canyon before entering what is known as Cardwell. Approximately 1.2 miles in length, this section of the North Platte meanders through the valley floor and would be best characterized as a meadow stream. Pocketwater, riffles, seams and small pools characterize the Cardwell section. Access is allowed on both sides of the river and it is a very wade-friendly environment. 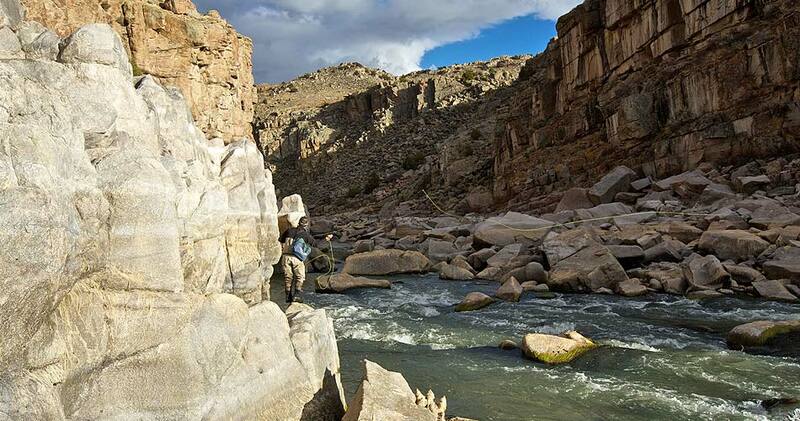 The hike into the canyon can be difficult; the fishing is typically worth it. Fremont Canyon is full of bus-size boulders, short riffle sections, deep pools, and some large trout. The scenery, with tall granite cliffs and abundant wildlife just adds to the ambiance. With 1.5 to 2 miles of fishable water Fremont canyon offers the wading angler an unforgettable experience. That said the footing can be treacherous, especially in the winter when ice forms on already slippery boulders. Fremont Canyon is located immediately downstream of Pathfinder Reservoir, just 10 miles from The Reef Fly Shop. The most scenic access is via Kortes Road in Alcova, Wyoming. After driving through remarkable geological formations along Kortes Road you will come to a fork. A large road sign directs you to the left for Miracle Mile or to the right for Fremont Canyon and Pathfinder Reservoir. Head right and you’ll drive toward The Cardwell Access area. The short 15-minute drive from our shop offers some of the best fishing on the North Platte. As always, for up-to-date Wyoming fishing information shoot us an email or give us a call at the shop and we can set you up with everything you need for an awesome day.